Produced in cowhide, the jacket offers eye-catching aesthetics. Includes composite protectors on shoulders and elbows. Elastic inserts on shoulder blades facilitate comfort and movement. The jacket also features adjustable waist fastening and jacket-to-pants zipper. 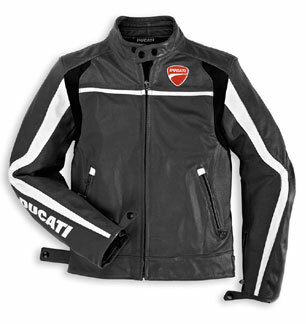 The Company look is ensured by the Ducati script on the right cuff and the shield on the heart and logo on the back. The men's version is also available in black and perforated black, whereas the ladies model is in black. Passion to be worn.